A stained roof can be a minor issue that leads to a very expensive problem. We are roof cleaning experts! Does your roof have ugly stains? 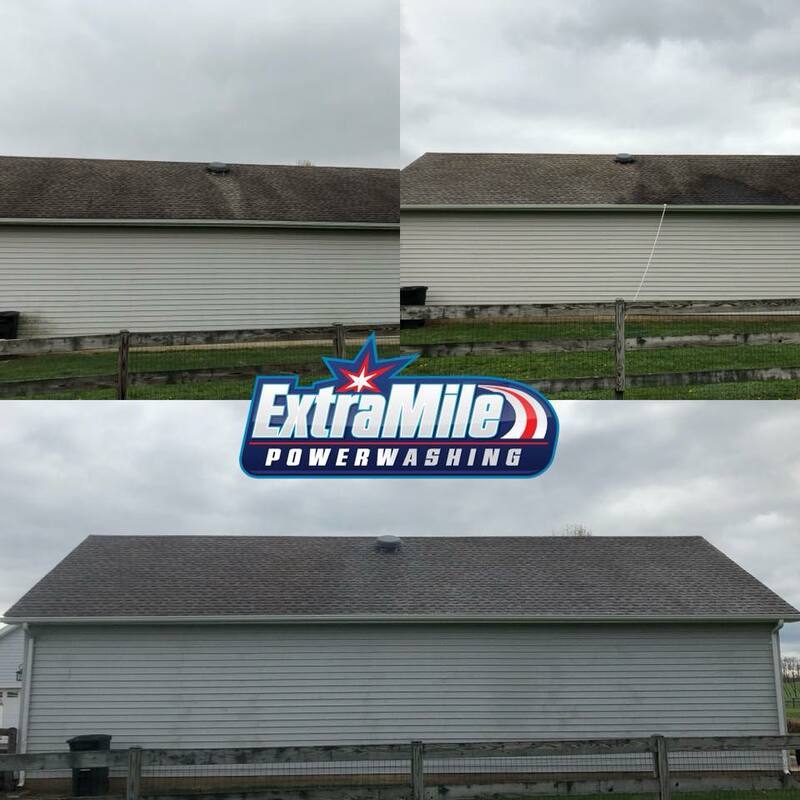 If the answer is yes, know that these dark streaks can be more than the difference between a beautiful home and an unsightly house. And while these stains are detracting from your home’s beauty, the real problem will come a few years down the road. Those stains are the build up of grime and/or algae. Such contaminants need to be pressure washed away sooner rather than later. 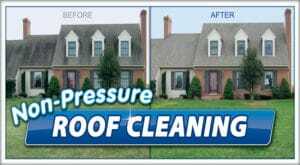 You can trust that we are the roof cleaning experts of the West Virginia Panhandle. The average lifespan of roofing materials is about 25 years. Unwanted element buildup can take years off that lifespan. And, we have never found anyone that wants to spend thousands of dollars on a new roof short of the manufacturer’s promise. The pressure washing experts at Extra Mile Powerwashing have years of training in the proper cleaning of roofing materials. The techs will also let you know if the gutters should be cleaned, because streaking is often a sign of natural elements that block gutters. Clogged gutters often affect the roof’s outer edges. This leads to water running down the walls. Water overflow can cause even more damage to your home’s exterior, and can leak inside the walls. Our techs use the “softwash” technique of low water pressure, combined with gentle detergents, to clean roofs. Softwashing is the best way to pressure wash building materials, because “power washing” can easily cause damage. This is usually due to improper use of a high pressure nozzle. Using high pressure is just one of the problems that homeowners and inexperienced pressure washers encounter. Water, slippery roofing materials and heights can be the perfect combination for a bad accident. If it happens to a homeowner, the pain and suffering are the likely outcomes. And beware If it is someone you’re hiring who CLAIMS to have a “pressure washing business.” Without experience and proper insurance, the result could be VERY costly to the homeowner. 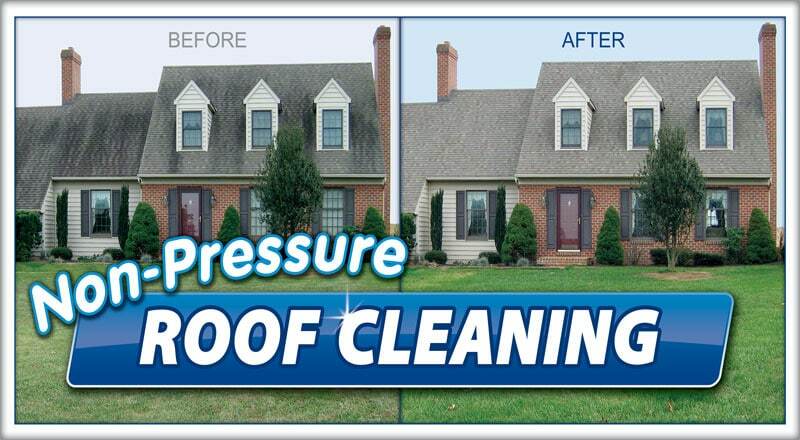 For a FREE roof cleaning estimate, call our Martinsburg, WV office at 304-904-0500 or contact us here.